An annual 'Secret Supercar Meet' organised by a supercar drivers' club has raised £22,000 for charity in just two hours, with millions of pounds worth of supercars and hypercars attending the event. Over 300 cars descended on Bruntingthorpe Proving Ground, Leicestershire, for the annual event, hosted by Supercar Driver - one of the largest supercar clubs in the UK. The meeting is the opening event in the group's motoring calendar, which sees supercar meets and road trips organised across the UK and Europe. Even dull drizzly weather couldn't stop supercar owners bringing out their cars. Just on the front row, cars included a Bugatti Veyron, two Koenigseggs, a road-legal Ferrari FXX, Aston Martin Vulcan, an ultra-rare Aston Martin One-77, two Ferrari F50s, a Ferrari Enzo and a Pagani Zonda – worth a combined total of £20 million. 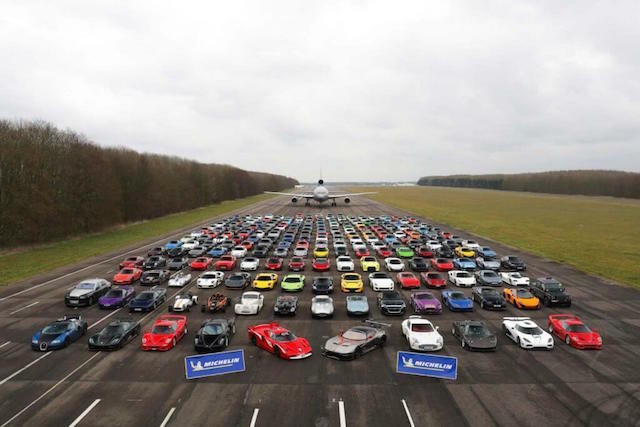 Each year, Supercar Driver takes a mesmerising and painstakingly organised photo of all the cars in attendance – usually with a plane in the background. This year's choice of aircraft was a TriStar jet. Supercar Driver and its members raised over £22,000 for its chosen charity in just two hours – Bluebell Children's Hospital – which it has nearly raised £100,000 for to date. The car club said: "It may seem a lot of trouble to go to for a photo, but it's much more than just that – it's a chance to bring everyone together to kick off the supercar season in the UK and all for a good cause. "The photo is the product of hours of planning, thousands of pounds, support from our key event sponsors, our team, marshals and the goodwill of all the drivers to create such a unique spectacle. We're over the moon with the support the event attracts and we are working towards a special 10 year anniversary event in 2020."